DECA asked and received a list from Make a Wish Foundation of children in Webster Groves eligible to be sponsored. 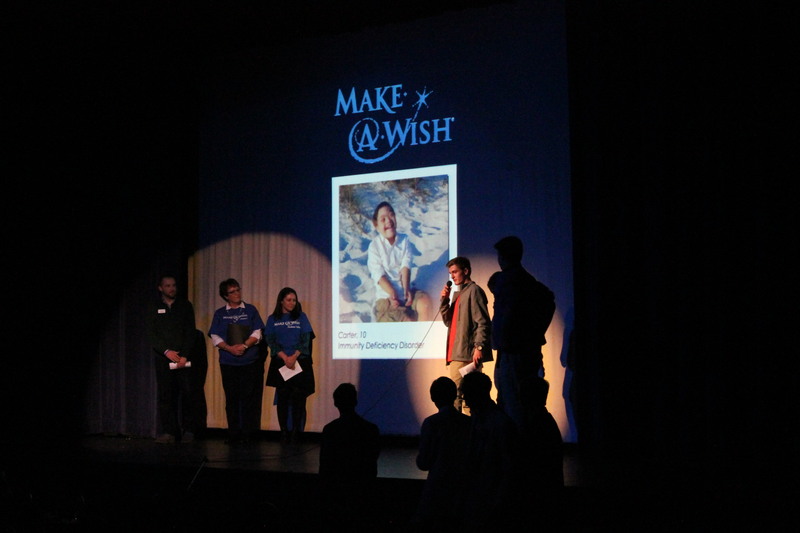 John Binder talks to the audience about Make A Wish fundraiser during Mr. Webster with some of the volunteers who know and work with Carter Dec. 3. Photo by Ashli Wagner. “We really wanted the community to rally behind someone and show support to them and their family,” senior John Binder said about why DECA chose to have a fundraiser for Make A Wish. DECA sponsor Kara Siebe told about where DECA got the idea for Make A Wish. “We went to a fall conference and met with Rockwood Summit, and Rockwood had adopted a child for an entire school. When we heard of this concept, we thought it was really cool because we’ve been looking for ways to collect all of the clubs together, and also the lip dub helped with that too, and we thought this might be nice to have a charitable organization that we all do together, so John Binder really spearheaded the campaign and approached different group, so yes DECA is taking a lead on it, but we want every group to do something special,” Siebe said. DECA wanted to choose someone younger, so he or she could look up to the high school students. All children would have been perfect, but DECA chose to sponsor Carter because he just seemed to fit the school. Make a Wish foundation is a worldwide non-profit organization which raises funds for children ages three-17 with life threatening medical conditions to have a wish come true. Like most boys, Carter likes watching “Mickey Mouse Clubhouse” and “Wiggles” on TV, listening to music and dancing with his family. However, he was born with cerebral palsy and other medical difficulties. Recently, he was diagnosed with a life-threatening immune deficiency which causes him to get sick easier. Carter’s mom said he is happiest when he is watching Disney and listening to Disney noises. 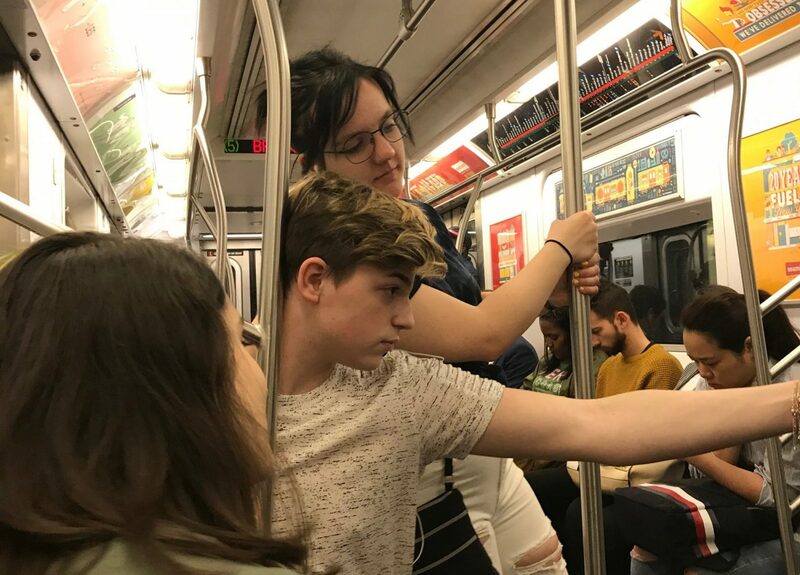 DECA intends to raise $5,000 to send Carter and his family to Disney for a once in a lifetime vacation, a day to relax and not worry, and just have fun. DECA had a miracle minute during Mr. Webster Dec. 3, and made over $1,300. “I was extremely happy the crowd could help Carter’s dream come true rather than my dream to be Mr. Webster,” Mr. Webster winner, senior Jamison Howard said. DECA is selling blue stars dedicated to Carter for $2 to hang up in Roberts Gym for the Dec. 10, basketball tournament game. DECA is also having a competition in first hour. The first hour class that can sell the most blue stars wins a doughnut party.